It’s been almost three months since the last episode of The Rockin’ Pop Party was shared on Mixcloud, but I am pleased to announce the next season of The Rockin’ Pop Party, season 6, will air LIVE every Friday at 3 pm Eastern (noon Pacific) on Magic 109! Those of you that have never heard of Magic 109 or my show before are in for a treat. Those that have heard of the station and/or my show, shouldn’t be all that surprised! Magic 109 is a brand new station, focusing on the presenters, instead of the listeners. Their philosophy is that if the presenter is happy doing their show, than chances are, the listener is too! The music they play is mainly focused from the 60’s on up through the 90’s, but they do play outside of those decades and do have ‘Christian’ content on Sunday’s, as well as promoting interaction with their listeners. Just check out the website for more information about the station, it’s presenters and programming! Back to The Rockin’ Pop Party though. There are some great specials in store for season 6, including; “Under the Covers”, The Rock & Roll Hall of Fame Nominees Special”, “The Rockin’ Pop Halloween Special”, “The Rockin’ Pop Left Over Edition”, “The Rockin’ ‘Round the Christmas Tree’ Pop Party”, “The Valentine’s Q&A Special” and any other random ideas that may come to my head down the road! Oh’, and I will take your suggestions and ideas for future shows as well too! If you don’t know already, the show has three segments, squeezed in three hours for the most part. The first two hours is mostly the music from the 80’s on up through today and has no particular name or title. I will take your requests and interact with you though. In the second hour, I present a segment called the “Between the Sheets: Cover Comparison” for your entertainment, which basically is an original track, followed by a cover, both of which are released after 1980. You then choose the better version and the winner is announced the following week! I’ll even sneak peek the contender for the next show as well. The last segment, everyone’s favorite, “The Rockin’ Hour in History” is featured during the last hour. It contains tunes before 1980 and occasionally features a specific year. It’s then your job as the listener to guess what year it is. Clues are given throughout the segment to help you figure it out though, so no worries! Enough about the show. What can you expect on the premiere episode of The Rockin’ Pop Party on Magic 109 this Friday? Lots of stuff! I’m not to sure what we’ll do for your “Between the Sheets: Cover Comparison” at the moment, but I’m sure you’ll find it worth your while to tune in and find out. “The Rockin’ Hour in History” will more and likely feature a specific year. What year is it? Well, that’s for me to know and you to find out! Of course, I’ll take your requests throughout the show and would love to hear from you! You can find my contact details on my site, make requests through the ‘Request Form’ on Magic 109’s website, call the studio line at +1 (978) 410-3020 or reach out to me on social media. The choice is up to you on what you wanna do! With all that said, I do hope you’ll tune in to the season 6 premiere of The Rockin’ Pop Party and the first episode to air on Magic 109 this Friday (August 31st, 2018) at 3 pm Eastern, that’s noon Pacific, right after The Rock Vault with Brice Mull, on Magic 109, breaking the radio dial, one tune at a time, 24 hours a day, 7 days a week! The Rockin’ Pop Party returns LIVE to internet radio! Well… Sorta! It’s been a very long time since The Rockin’ Pop Party has been live, but I am pleased to announce that it will return LIVE to internet radio on April 14th, 2018 at 4:00pm Eastern! Well, sort of anyway. Since I got the new PC, I have been quietly working on providing a platform for The Rockin’ Pop Party to stream live. This also opens up other great opportunities as well. This platform is what I like to lovingly call, G Spot Entertainment, the best music and entertainment, one ‘eargasm’ at a time! Currently, G Spot Entertainment is only streaming when a show is LIVE and there is no music or automation before or after the live presentation. Right now, G Spot Entertainment is only used to stream the show LIVE, to provide the interaction that it once had when it was broadcasted on legit (or in some cases, illegitimate) internet radio stations. 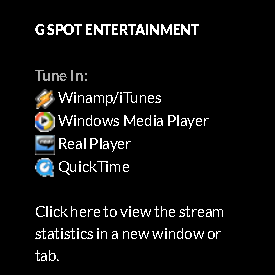 You can tune in with your favorite media player or mobile device and view the stream statistics using the G Spot Entertainment widget on the left side of my website. There may be other methods of tuning in at a later time, if it becomes necessary. For now though, this is what you get! Don’t worry, The Rockin’ Pop Party will still be provided as a podcast on Blubrry, Google Play, iTunes, Mixcloud, Stitcher and TuneIn. That won’t change, but it means that it will be released more and likely on Saturday night or early Sunday morning instead of on Friday’s. With all the technical ‘mambo jumbo’ out of the way, I do hope you’ll catch the The Rockin’ Pop Party LIVE every Saturday at 4:00pm Eastern, beginning April 14th, 2018. If you have any questions, comments or concerns about G Spot Entertainment or The Rockin’ Pop Party for that matter, feel free to get in touch and I’ll do my best to answer your feedback. The Rockin Pop Party can now be heard as a podcast and is on most your major podcast services! That’s right! You read the subject line correctly folks! Now, you can find “The Rockin’ Pop Party” on your favorite podcast service! No more having to find the show on Mixcloud and figuring out how to get the embedded player or app to work for you! Of course, you still can, but why would you want to? This means you can get an Amazon device, like an ‘Echo’ or ‘Dot’, or even a Google device, like the ‘Google Home’ to play the latest episode for you! Just simply say; “Play The Rockin’ Pop Party with Geno J on TuneIn!” Don’t have one of these devices? You can find the show on Google Play, iTunes, Stitcher and TuneIn manually or use the links below and subscribe to it, so that you’ll always have the latest episode waiting for you! If all else fails though, you can subscribe to the podcast right here as well! The Rockin’ Pop Party get’s funny! Every week, I do The Rockin’ Pop Party in it’s usual format with the “Between the Sheets: Cover Comparison” in the second hour and “The Rockin’ Hour in History” to wrap up the last hour. However, wouldn’t it be nice to deviate from the traditional format to something a bit different? Well, I’d like to announce that The Rockin’ Pop Party will be for one week only, The Rockin’ Pop Parody! Initially, this idea was more of an accident, but aren’t mistakes wonderful sometimes? I mean, if it weren’t for a spelling error, this show would have never happened! This special episode will consist of comedy bits, parodies and just fun music in general. The show will air on Saturday, July 15th, 2017 at 4:00pm Eastern! There will be a “Between the Sheets: Cover Comparison” and will have “The Rockin’ Hour in History” too! If you’re a fan of comedy, need a laugh, or just want a good reason to smile, then I’d encourage you to check out this show! This special episode of The Rockin’ Pop Party will be LIVE on Sky 106 and will be on it’s TeamTalk server as well! There will generally be more commentary during this one-off show too, which means you the listeners are welcome to join in on the festivities! Your hearing about this now, because I’d love your contributions to the show! Just contact me for any requests or dedications, or whether you have any comical topics of discussion that should be shared on air! I do hope you’ll join me for this occasion, as I’m pretty sure you’ll at least laugh once during the show. It all happens again on Saturday, July 15th, 2017 at 4:00pm Eastern on Sky 106, where you always get the best variety out of the clear blue sky! Season 5 of The Rockin’ Pop Party marks a new era in entertainment! Since May of 2010, The Rockin’ Pop Party has been a stronghold to a couple of internet radio stations that have had the honor and privilege to carry the program, in particular the now defunct HitMeRadio and it’s home as of now, Sky 106. On June 3rd, 2017, a significant change to the show will occur that will forever immortalize all future episodes! The season five premiere of The Rockin’ Pop Party will mark a new beginning and promising future! The most significant changes to the show will be its new intros for the start of the show and “The Rockin’ Hour in History” featured in the last hour. The new episodes will also have specific new spots, liners, drops, a new outro, and other content that will set this season apart from all past seasons. For more than seven years, The Rockin’ Pop Party has used the same intros for each hour of the show and it’s outro to wrap it up, and even though it has evolved over the years, it has pretty much stuck to the same content. Sure, the old intros and outro will be missed, but I promise you that the new ones will be just as unforgettable as the old ones! Like every other mark of a new season of The Rockin’ Pop Party, there is always all the specific and special shows to look forward to; some of them being “The Under the Covers” episode in September, “The Rockin’ Pop Halloween Radio Show” around Halloween, “The Rockin’ Around the Christmas Tree” special in December, not to mention all the other spontaneous ones along the way! I have quite a few new ideas as well and am looking forward to sharing those with you all as well! The new season of The Rockin’ Pop Party again begins on June 3rd, 2017 on Sky 106 and will definitely be something you don’t want to miss! If you have any suggestions for season five of The Rockin’ Pop Party, then by all means let me know, as I’d love to hear from you! Get ready! The Valentine’s Q&A is 3 weeks away! Are you tired of being left in the dark with your significant other? 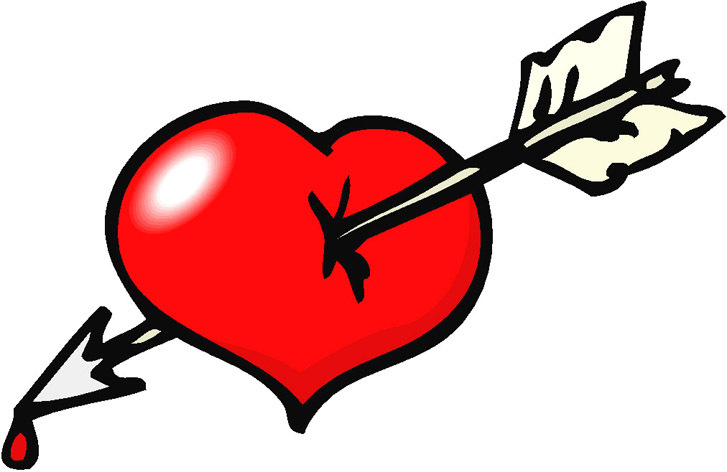 Have you tried all these dating sites and have had no luck? Maybe you need to spice up you and your partner’s dating life. If these are questions that need answering in your life, The Rockin’ Pop Party’s 2nd Annual Valentine’s Q&A Special might have the answers you’re looking for! Join myself and Mz. M as we play your favorite love/hate songs on Saturday, February 11, 2017 at 4:00pm Eastern on Sky 106! We’ll answer your tough questions regarding love, relationships and intimacy. Heck, we may even have a few fun games in mind too! It’s definitely an event that you don’t want to miss, this I assure you! Last year, we had so much fun! Mz. M and I had so many questions, that we weren’t able to get through them all in three hours and I imagine this year will be the same. That being said, if you have questions for us, don’t be shy and send them in! There are a few different ways you can do this. You can always email us your questions, but you can also call the studio line at +1 (978) 410-3020 or get in touch with us on Facebook or Twitter! Me and Mz. M are looking forward to answering all your questions and hope you’ll join us for all the fun and games during The 2nd Annual Valentine’s Q&A Special, Saturday, February 11, 2017 at 4:00pm Eastern, exclusively on Sky 106, where you get the best variety out of the clear blue sky! The mid-season premiere of The Rockin’ Pop Party returns next Saturday! With 2016 done and over with, it’s time to bring in the new year with more new music, covers, friendly banter and more! Don’t miss the mid-season premiere of The Rockin’ Pop Party on Saturday, January 14, 2017. If you thought the last episodes of The Rockin’ Pop Party in 2016 were good, wait till you hear the rest of season four! What kind of things should you look forward to the rest of this season? Well, I really don’t like tooting my own horn, but toot toot! I have a few good ones coming up! The first upcoming event on the way is The 2nd Annual Valentine’s Q&A Special of The Rockin’ Pop Party. Last year, this show was riddled with your questions and no doubt this year will be no different. I’ve also been seriously thinking about this one too and did it a couple of years ago, but I’ve decided to bring back The Country Fried Edition of The Rockin’ Pop Party later this year too! Many of my listeners have found an all country rendition of The Rockin’ Pop Party their favorite! Enough about the future upcoming shows though. The mid-season premiere of The Rockin’ Pop Party will be of course my “Best of” show. What were some of your favorite songs of 2016? What do I have in store for the first “Between the Sheets: Cover Comparison” for 2017? What songs in the Year-End Hot 100 Billboards did I actually like in 2016? For that matter, were there any at all? All these questions and more will be answered on Saturday, January 14, 2017, exclusively on Sky 106, where you get variety out of the clear blue sky! Join me this Saturday, (May 28th, 2016) for my last show on Sky 106! This will also end season 3 of The Rockin’ Pop Party as well. I’ll be playing a lot of celebratory tunes in honor of my time at Sky 106 as I end this season and start Season 4 on a new station very soon! Your involvement and participation in my last show on Sky 106 would be appreciated! I’ll have the studio line open and won’t even be following the usual format of the show. That’s right! There won’t be a “Between the Sheets: Cover Comparison” or “The Rockin’ Hour in History” for this show, but I’ll be playing EVERYTHING you want to hear! Whether you want to hear rock, pop or country, from today to even something years and years ago, I’ll honor your requests and dedications for this special occasion! So, do call in, share memories, make requests and more, as you’re more than welcome to! This special show again begins this Saturday at 4:00pm Eastern on Sky 106. I really do hope you’ll join me for this audacious event and celebrate the end of season 3 and the last show on Sky 106, as well as the new beginning of The Rockin’ Pop Party coming soon!